Many people accuse Christians of being homophobic, but is this accurate? The word “homophobic” was not even used until 1969 and part of the word, “homo,” originally stood for the genus or human species (homo sapiens), while “phobia,” is basically an obsessive fear of something like flying, fear of heights, fear of the outdoors, fear of closed spaces, and so on. There are so many phobias today that it’s impossible to even name them all, but many phobias have been born during a traumatic childhood experience, although many adults have had such occurrences later in life, but the intent of this article is to look at people who are homophobic (and they’re not all believers), and then, how we should respond to homosexuals (and all people). A homophobic has an unreasonable fear or hostility toward homosexuals. Clearly, this is not Jesus’ approach to sinners, or none of us would make it. To have fear or hostility towards homosexuals will only push them further away from you, and we are not to have hostility toward others. God may grant them repentance (2nd Tim 2:24). Let the Word of God and the Spirit of God convict them. We make a poor imitation of the Holy Spirit. We can even hamper what the Spirit is trying to do in a person’s life. Jesus said love is the greatest apologetic because it will show others whether we really are (or are not) His disciples (John 13:34-35). Love wins over debate or condemnation, but we must still speak the truth in love (Eph 4:15), and that means we tell all who don’t believe that Jesus said we must repent and believe (Mark 1:14-15). We can’t repent for someone any more than we can believe for them. God can use us as a means to save some, and not just homosexuals, but all sinners outside of Christ need to hear the Word of God and have the Spirit of God to become the children of God. We cannot convince anyone, and even if we do, it won’t last. Whatever I can talk someone into, someone can talk them out of. It must be the Spirit that creates a new creation in Christ (2nd Cor 5:17). No matter what sin it is, all sin needs atonement. One tiny sin is all it would take, so singling out one sin over another doesn’t seem fair. Our small church has had men come out of this lifestyle by God’s grace and power, but we did provide some means for them to battle this temptation. Most of it has been done when serving with one another in one of our ministries. If we act as if people will never repent and believe, then we are giving them no hope at all, and by the way, that is really God’s prerogative. It is only His sovereign right to decide. It is far too easy to become judge and jury when seeing a group in society doing certain things that God forbids in His Word, but instead of having a self-righteous anger, we ought to be like Jeremiah the Prophet who wept for his people…and so we also ought to weep and pray for those who are perishing apart from Christ…no matter who they are or what they do. Some of these precious souls may be part of your own family! So weep for and pray for those who are separated from God at present, and as we once were. The sin I think would be if you told a lost person, “It’s okay, God forgives, God is love and He accepts you just the way you are,” however, God grants repentance, and godly repentance should bear some fruit, like overcoming sin; never to the point of sinless-ness, but to a point where they should be sinning, less. Yes, He does accept sinners as they are, but they shouldn’t stay as they are. 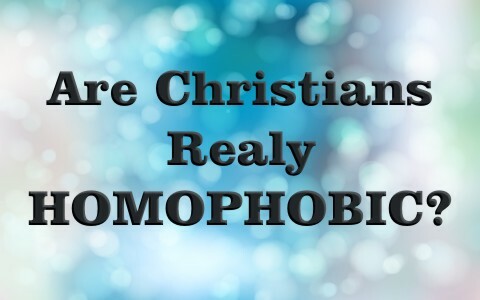 Now, here is the question we will deal with: Are Christians homophobic? Yes. Are there just a few or many? I think there are fewer than we think, even though society thinks there’s more, but that’s because all believers are often collectively swept into the same category of those who are on the fringes. Why are they homophobic in the first place? Do they think it’s their job to warn lost sinners that they’re damned to hell, including homosexuals? Is this sin singled out by more believers than any other sins? What are ways we can better relate to people in the world who are living in sin? What’s a biblical approach? I love the account where the self-righteous Jews brought a woman to Jesus who was caught in adultery, although the man’s absence is clearly missing, which is obviously a double-standard. Who knows, it might have been a trap by the Jews so that a man colluded to catch her in adultery. We are not sure, but whatever way it was, Jesus told them that whoever is without sin can cast the first stone. The only one there that really had an actual right to cast a stone was Jesus because He was the only one without sin, however even Jesus didn’t condemn her. He simply told her, “Go and sin no more” (John 8:11), meaning she could come as she was and be forgiven, but not stay as she was (e.g. “sin no more”). Jesus knew her heart. He saw her godly sorrow and repentance. Jesus approach is as the Apostle Peter says, “But even if you should suffer for righteousness’ sake, you will be blessed. Have no fear of them, nor be troubled, but in your hearts honor Christ the Lord as holy, always being prepared to make a defense to anyone who asks you for a reason for the hope that is in you; yet do it with gentleness and respect, having a good conscience, so that, when you are slandered, those who revile your good behavior in Christ may be put to shame” (1st Pet 3:14-16). A harsh response or having a judgmental attitude is still casting stones. To be sure, we need to be clear about the vast difference between what we think and what God’s Word says. It’s one thing to say, “I believe that Jesus is a way to eternal life,” but it’s a totally different thing to say, “Jesus said, “I am the way, and the truth, and the life. No one comes to the Father except through me” (John 14:6). He’s not just a way, but The Way! When we hear people say that they think they’re many paths to God, all you can say is, “Jesus said He is the one and only way. Why would He say He’s the only way? Which other way is there? Anyway, that’s what Jesus said. Do you believe Him? It’s important to make the clear distinction between telling someone we know, “I think it’s wrong to cheat on your spouse,” and “God’s Word says He will judge all adulterers. I am worried about you my friend. Can we talk?” When we just give our own opinion, and not the Word of God, we lose all credibility. That’s because they’re response is the same as yours, a human opinion. Their source is no better than yours, but God’s Word is “the” source of all objective truth. Rely on it. It’s got the power (Rom 1`:16; 1st Cor 1:18). Are some believers homophobic? No doubt there are many, but they do not stand for the majority of Christians, who it is hoped, will offer the gospel of Christ to make them see the need for the grace of God. That gospel doesn’t just give them hope, it gives hope to everyone. Remind them that we too were once an enemy of God (Rom 5:10) and had God’s wrath abiding on us (John 3:36b), and that no sin is too serious or grievous that God will not forgive. Just confess them, no matter what it is. We should take heed because there go we but by the grace of God, so have compassion. Witness to them with gentleness and respect, and make love your greatest apologetic (John 13:34-35). Take a look at this related Bible study: Can A Person be Born Homosexual? Part of the problem with interpreting this passage is that Jesus, under the Law of Moses, could not break the Law which required that He, for one, had to be a witness of the adultery to pass judgment and He wasn’t. There are other details in these Mosaic Rules that were required as well, which again, didn’t allow Jesus to cast any stones. One thing He could do was tell her to “Go and sin no more” He never overlooked her sin. Yes, it was a trap to see if Jesus would break the Law He was under and therefore be guilty of sin for not following the Law. Previous post: Were Adam and Eve Saved? Next post: What Does God Say About Serving Others?